This is one of the latest versions of our Model 9 which has 3 arms approx 5" long and 3 size 3.5(1.56") nickel brass willowleafs. This Model uses premium 0.040 SUPER BROWN stainless steelwire. This wire is more rigid than previous stainless steel wire. The Premium Wire will hold the frame much better allowing for less adjustment between cast. 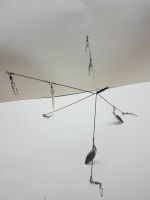 Standard on this Model is 3 leads of ~4.5” and steel willowleaf blades attached to the leads . 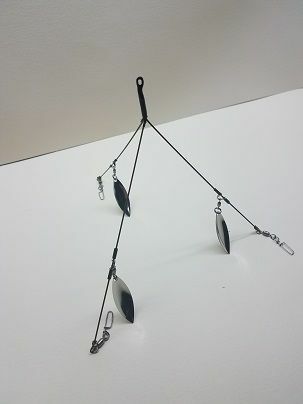 The swivels are the NEW Standard (Approx 75# test) Crane Swivels with a coastlock clip. They are installed using a hand tool designed for twisting the wire and NOT just a bent over wire. There is NO bulky head up front since the rig is headless using our Brazing technic to assemble the wires. Testing shows there was not any difference in the size or number of fish caught with or without some fancy head on the rig. We also are now installing a Brass Collar behind the braze to allow a bending point away from the braze to reduce or eliminate any breakage.